In the playoffs of The StarSeries i-League Season 7 starting on April 5 we have Renegades vs Ninjas in Pyjamas. We’ll talk below about their group stage matches, our expectations for the game and then provide a betting prediction. In the group stage Renegades only played against 3 teams and they finished 2nd. Ninja in Pyjamas ended 7th after playing 5 matches. As already mentioned, Renegades finished 2nd in the group stage with 3 wins and 0 losses. They played against TYLOO (2-0), MIBR (2-1) and FaZe Clan (2-1). This team showed us nothing but discipline on this tournament. They won all the maps they picked and they managed to keep calm in the third deciding map. They are in great form currently and they can be the dark horses of the tournament. NiP had 3 wins and 2 losses in the group stage. They won against North (2-1), ViCi Gaming (2-0), and Team Spirit (2-0). However, they lost against Fnatic (1-2), and Natus Vincere (1-2). This team is one of the most experienced teams in the world and they are veterans of this sport. No matter how bad their current form is, their experience can prevail and they can win against anyone. Both of these teams showed us great matches during this tournament. However, I would say that Renegades showed us better confidence and performance in crucial moments. Also, I think that all maps will be close. I wouldn’t even be surprised if one of the maps goes to overtime. 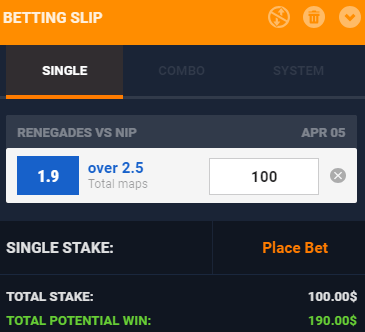 Statistically, Renegades are in a better form and they should win this. Nonetheless, NIP showed us that they can outperform anyone and you should be smart while betting on this match. This would be a close match and NIP can even win this. Renegades won both matches against tier 1 teams with 2-1, while NIP won 1 with 2-1 and lost 2 matches with the same score (1-2). Both teams are great on their own map of chose, and the third map can go in favor of anyone. The smartest thing to do is to avoid betting on the team and to bet on the number of maps.